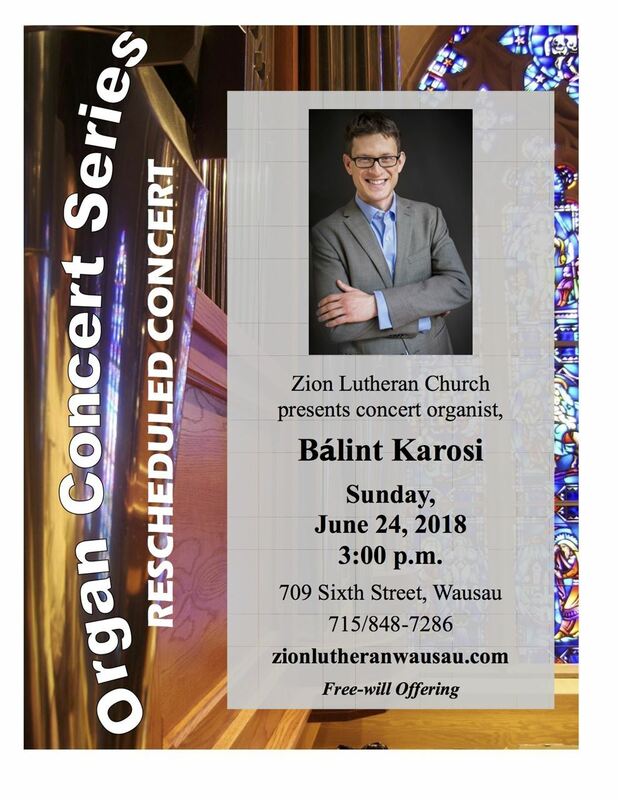 Zion Lutheran Church is pleased to present Bálint Karosi as guest artist in their Organ Concert Series. He has won first prizes at the J.S. Bach Competition in Leipzig, the Dublin and Miami International Organ Competitions and the Improvisation Competition of the University of Michigan. An avid interpreter of Bach, he has recorded three CDs of Bach’s music, most recently the Art of Fugue and the Clavier-übung III, released by Hungaroton. In 2015 Bálint Karosi was appointed as Cantor at Saint Peter’s Lutheran Church in midtown Manhattan, where he oversees an ambitious musical program, with frequent performances of choral and orchestral works including a yearly performance of one of J. S. Bach’s Passions on Good Friday. The concert will be held at Zion Lutheran Church, 709 Sixth Street, Wausau, Wisconsin on Sunday, June 24, 2018 at 3:00 p.m. A reception will follow the concert. The church is handicapped accessible. A free-will donation will be received. For more information you may call: 715-848-7286 or go to Zion’s website: zionlutheranwausau.com.